Bewitched Producer William Asher R.I.P. Last night at about 12:30 AM a heavily armed man (I refuse to have his name in my blog) entered the Century 16 Theatre in Aurora, Colorado, tossed smoke grenades into the thetare, and then opened fire. The cinema was showing the latest Batman film, The Dark Knight Rises. In the end 12 people were dead and another 60 were injured. I do not think anyone could not hear or read of this event and not be horrified. While I have never lost anyone to murder and I cannot claim to know what the families of those who died are going through, my heart goes out to them. I cannot help but feel an express sorrow at such senseless and needless loss of life. While I took a total of twenty hours worth of psychology classes at university, I still cannot comprehend what kind of monster would walk into a theatre and commit wanton murder. What happened last night makes no sense at all to me. Sadly, mass shootings are hardly unknown. I think everyone remembers the massacre at Columbine High School in Columbine, Colorado. More recently, there was a mass shooting at Eaton Centre in Toronto, Ontario last month. And certainly I don't think anyone can say the Aurora, Colorado Century 16 Movie Theatre massacre is any more or less horrific than any other mass shooting. Still, it does feel much more personal to me. While I did not know any of the victims nor their families nor anyone in the theatre, this particular mass shooting has struck a much deeper chord with me for two basic reasons. The first is that, as many of you know, I love the cinema. Some of the happiest moments of my life have been spent in a darkened theatre watching the flickering images of a movie I love on the screen. For me, as with many people, the cinema is a place where one can escape to another world, where one can leave his or her problems behind. What is more, it is one of the few shared experiences between strangers left today. You might not know the people sitting in the other rows or even beside you, but for those few hours you are part of a community that is experiencing the same thing. I realise I am probably saying this with a bit of exaggeration, but to me the cinema is sacred. For me the thought of someone walking into a cinema and disrupting it with bloodshed is horror beyond belief. For me the culprit launched an attack on a place that is only equalled by libraries in their importance in my life. The second reason the Aurora, Colorado Century 16 Movie Theatre massacre has touched me so is the importance of Batman in my life. Batman has been a part of my life for so long that I cannot even remember when I first heard of the character. I suspect I was barely out of diapers when I first saw the 1966-1968 Batman TV series. 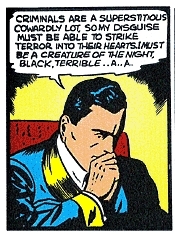 The Sixties Batman TV show was played for comedy, but it led me to the "Batman" comic books of the time, where Batman was a much more serious character--the Dark Knight that had originally first appeared in 1939. Reading "Batman" comic books made me want to write comic books. Eventually the thought of writing comic books would give way to simply writing. In a sense, then, I owe the fact that I am a writer to Batman. In a way, then, it feels has if the culprit behind the mass shooting at the Century 16 cinema in Aurora, Colorado has tarnished part of my childhood. Currently, there is some question as to how the massacre will impact the box office of The Dark Knight Rises. I have heard from some people that they will not be going to see it now. I don't know how common this attitude is or if the individuals who do not plan to see the film won't change their mind in a few weeks. That having been said, I plan to see The Dark Knight Rises, as I have planned for the past few years. My thought is that if I change what I would usually do because of this tragedy, then evil has won. Of course, regardless of how the Century 16 Theatre massacre has impacted me, I realise that it is nothing compared to what the family of the victims are going through right now. Words are not adequate for what happened last night. It was a horrific tragedy that should have never happened. My heart goes out to the victims and their families. It is rare that classic film buffs talk very much about recent films. When we do, they are usually movies that try to portray individuals and situations from film history (My Week with Marilyn) or remakes of classic films (True Grit). And more often than not, we classic film buffs have very little good to say about such films (the Coen Brothers' remake of True Grit) seems to be an exception. That having been said, last year there was a film that had classic film buffs talking that neither sought to portray actual events from film history nor revisit a classic film. That movie was The Artist (2011). What had classic films buffs talking about the film is the fact that it was made as if it was a silent film made during the transition to sound (roughly from 1927 to 1929). What is more remarkable, is that The Artist received largely positive buzz from classic film buffs and even won the Academy Award for Best Picture. This past Sunday I finally had the opportunity to see what everyone had been talking about (sadly, when it was in theatres the nearest one showing it was 30 miles away). The Artist was largely the creation of writer and director Michel Hazanavicius, who had already delved into film history with his previous two films. OSS 117: Cairo, Nest of Spies and OSS 117: Lost in Rio were parodies of the Sixties spy films in general and the popular "OSS 117" movies of the Fifties and Sixties in specific. It should then not have been a surprise that for his next film Mr. Hazanavicius wanted to make a silent film that would tribute to Hollywood as it was in the late Twenties and Thirties. The Artist does indeed pay tribute to the Hollywood of old, not just the Hollywood of the Silent Era, but Hollywood during its Golden Age well. The film is set in the years from 1927 to 1931, the same era as Singin' in the Rain, and like Singin' in the Rain the transition to sound is fundamental to its plot. At the same time the plot of The Artist resembles the various versions of A Star is Born, centring on the relationship between an older star of Silent films (George Valentin, played by Jean Dujardin) and a younger star of the new Talkies (Peppy Miller, played by Bérénice Bejo). The Artist evokes other classic films as well. A scene from one of George Valentin's films not only evokes Metropolis (1927), but the serials of the Thirties and Forties as well. A clip from Douglas Fairbanks' classic The Mark of Zorro (1920) appears in the film. And, of course, there is the notorious use of a portion of the Vertigo soundtrack (more on that later). Even star Jean Dujardin evokes Hollywood's past, as he looks like a dead ringer for Douglas Fairbanks in his prime. Of course, it is one thing to play homage to films of the past, it is quite another as to whether The Artist could capture their spirit. In my humble opinion, The Artist succeeds admirably. Indeed, Michel Hazanavicius considered details that many directors may well have overlooked. The film was shot in 1.33:1 screen ratio that was in common use during the Silent Era. While The Artist was shot in colour, it was converted into black and white. Despite this fact, Guillaume Schiffman's cinematography captures the look of the old Silents quite well. The film was even shot at 22 frames per second rather than today's standard 24 frames per second to duplicate the look of a silent movie. Even Ludovic Bource's score sounds like something that could have been written for a silent film. Here I must point out that The Artist does not simply replicate silent films in general, but it replicates a specific era of silent film: the Silents of the late Twenties before the advent of sound. Michel Hazanavicius did an admirable job of capturing the look and feel of a late Silent. Not only do the title cards look like those of a silent movie from the late Twenties, but they are also somewhat infrequent (by that point in film history directors had come to rely less on title cards to get their point across). The acting style of the performers is more naturalistic, much like those of the late Silent stars, with none of the exaggerated expressions and gestures of earlier Silent films. Even the plot resembles the Silents of old. It is a melodrama with many touches of comedy, not only allowing it to feel like a silent film, but making it likely that modern audiences would enjoy it as well. While over all The Artist does do a good job of capturing the feel of a silent film, I must admit that in my humble opinion it could have done a little bit better. Some of the dialogue seemed a bit too modern to my ears. As an example, while the word "loser" has existed in the English language for centuries, I am not sure that the phrase "You loser!" would become common until the Sixties or Seventies. I also thought that the presence of Rose Murphy's version of "Pennies from Heaven" was slightly out of place in the film. In the days of silent movies I do not believe most theatres would have had a vocalist on hand to sing a song during the movie! I must also say that I thought that Bérénice Bejo looked a bit too modern to be a movie star in the era of the early Talkies. While I thought Miss Bejo did a good job as Peppy Miller, I thought The Artist could have been even more convincing as a silent film with an actress who looked more like she belonged to the era. While there were exceptions (Joan Crawford, for one), it seems to me that many of the most popular actresses of the era (Clara Bow, Louise Brooks, Colleen Moore, and so on) had a similar look. They all had heart shaped faces with cupid bow lips. It was a look that remained fashionable into the early Thirties and the early Talkies--indeed, it is the look of animated star Betty Boop (whose appearance was based on singer and actress Helen Kane). While Miss Bejo did do a good job as Peppy Miller, then, I think The Artist may have felt even more like a late, silent film with an actress with a Clara Bow/Helen Kane look in the role. There is one thing I thought would detract from the film that did not, the controversial use of a portion of the Vertigo score (specifically "Love Scene (Scène d'amour)") in the soundtrack. I must say that I disagreed with Kim Novak that it was wrong for "Love Scene (Scène d'amour)" from Vertigo to have been used in The Artist. During the Golden Age of Hollywood, the studios regularly reused music (just how many times were portions of Max Steiner's King Kong score reused? ), so that it did not bother me that Michel Hazanavicius reused part of another film score. What bothered me before seeing The Artist was whether Bernard Hermann's classic work would not be too modern for The Artist, that it would not spoil the illusion that I was watching a film from the late Twenties. Fortunately, it turned out that it was "Love Scene (Scène d'amour)" that was used and not another part of the Vertigo score. "Love Scene (Scène d'amour)" blends in so well with the rest of The Artist soundtrack that while you might consciously recognise it, you won't be thinking, "This would never be used in part of the score for a silent movie). By now I imagine many of you might be asking, "Well, you think The Artist does a good job of capturing the feel of silent films, but is it any good?" To that I must answer that it is a very enjoyable film. Never mind that it does a great job of capturing the look and feel of silent films, The Artist is a well written film that is very entertaining and quite enjoyable. Mr. Hazanavicius' script goes beyond merely capturing the feel of silent films, but tells a story that will keep one riveted to the screen until the very end. He has created a believable plot with believable characters with a good deal happening to maintain one's interest. For film buff the script also contains a number of film references in addition to those previously mentioned. The Artist also benefits from a great cast. Not only does Jean Dujardin look like Douglas Fairbanks, but he is very convincing as silent film star George Valentin. Mr. Dujardin's Valentin is simultaneously a carefree actor with a bit of an ego who at the same time has certain principles. Jean Dujardin is so convincing as George Valentin that one could almost believe Valentin actually existed. James Cromwell gives a very touching performance as Valentin's loyal valet, Clifton, who stands by Valentin through thick and thin. John Goodman does a great turn as the boisterous head of Kinograph Studios, Al Zimmer. While I do think the role of Peppy Miler could have been better cast, Bérénice Bejo does well in the part. Miss Bejo endows Miss Miler with a charm and grace that one could almost believe she was a silent star. 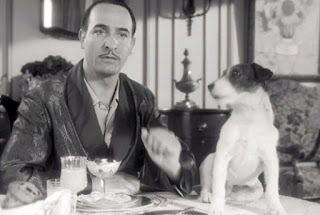 Of course, here I must mention my favourite performer in the film, Uggie as The Dog. Uggie is quite impressive. He is not merely a dog who can do tricks, but one who can really act. Uggie is every bit as expressive and emotive as the human actors. The Artist is not a perfect recreation of silent films. There are some anachronisms in language and other areas. That having been said, it captures the feel of the Silents so well that only the pickiest of silent film connoisseurs would not be able to overlook these anachronisms. Even then, I suspect even the pickiest of silent film connoisseurs would be too caught up in the plot, the performances, and the sheer effervescence of The Artist. It is so entertaining and enjoyable that even the average modern film goer, accustomed to colour photography and sound, will find himself or herself taking delight in the film. Over all The Artist is an entertaining and enjoyable movie that captures the spirit of the Silents quite well. Here I must say that if one enjoyed The Artist and particularly if he or she also loves the original silent films, he or she might wish to watch Mel Brooks' classic parody of the form Silent Movie (1976) and the more recent The Call of Cthulhu (2005), a film produced as if Lovecraft's classic short story had been adapted to film in the Twenties! William Asher, who produced Bewitched, directed I Love Lucy, and created The Patty Duke Show with Sidney Sheldon, died Tuesday, 18 July 2012, at the age of 90. The cause was complications from Alzheimer's disease. William Asher was born 8 August 1921 in New York City. His father E. M. Asher would be an associate producer on several films, including such classics as Frankenstein (1931), The Old Dark House (1932), The Black Cat (1934), and Dracula's Daughter (1936). The family moved to Los Angeles when William Asher was 10 so that his father could work in the movie industry. His parents divorced when he was eleven and young Mr. Asher returned to New York City with his mother. He would return to Los Angeles, where he got a job in the mail room at Universal Studios. During World War II he served in the Signal Corps of the U. S. Army. It was at that time he began selling short stories to magazines. It was following the war, in 1948, that he began his career in Hollywood by producing the low budget boxing film Leather Gloves with Richard Quine for Columbia Pictures. The film also marked his directorial debut. It was in 1951 that he moved into television, directing an episode of Racket Squad. Over the next few years he would direct episodes of such shows as Big Town, Where's Raymond?, Make Room for Daddy, The Lineup, General Electric Theatre, and December Bride. It would be in 1952 that he would begin directing the show for which he is best known besides Bewitched: I Love Lucy. It was Desi Arnaz who initially asked Mr. Asher to direct an episode of the show. In the end, Mr. Asher directed 100 episodes of I Love Lucy, remaining with the show until its end. Following I Love Lucy he directed episodes of The Thin Man, Fibber McGee & Molly, and The Twilight Zone. The short lived adaptation of Fibber McGee & Molly would also be the first series that he regularly produced. It was in the Fifties that William Asher also broke into writing for television, writing episodes of The Big Town and Sally. In the Fifties he would also direct three feature films: Mobs Inc. (1956), The Shadow in the Window (1957), and The 27th Day (1957). The Sixties would prove to be a golden era for William Asher, a period during which he directed, produced, or wrote some of his most famous works. It was in 1963 that Mr. Asher directed Beach Party, the first of American-International's "Beach Party" movies. During the Sixties he would also direct the films Johnny Cool (1963) and Fireball 500 (1966). While the "Beach Party" movies were highly successful, arguably his biggest achievements would be in television. He co-created The Patty Duke Show with Sidney Sheldon. He also directed and produced episodes of the series. 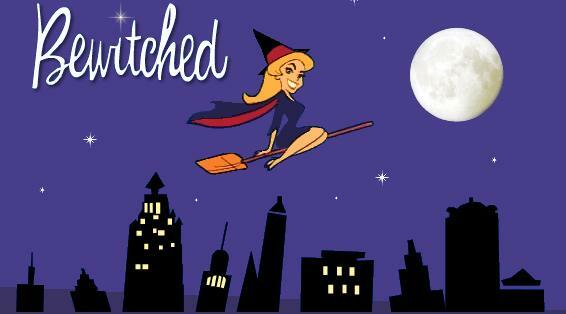 What may be his best claim to fame may be as producer of Bewitched. He remained the show's producer for the entirety of its eight year run and directed a lion's share of its episodes. While Sol Saks is often credited as the creator of Bewitched, there can be no doubt that William Asher (who was also married to star Elizabeth Montgomery) shaped the show into what we know today. He also directed episodes of the short lived series Gidget. In the Seventies William Asher produced The Paul Lynde Show and Temperatures Rising. He directed episodes of The Paul Lynde Show, The New Temperatures Rising, Lucas Tanner, Marcus Welby M.D., Operation: Petticoat, Tabitha (a spin off from Bewitched), Alice, and The Bad News Bears. He developed the series The New Temperatures Rising. In the Eighties he directed episodes of Private Benjamin, Harper Valley P.T.A., and Crazy Like a Fox. He directed the films Night Warning (1982) and Movers & Shakers (1985). Mr. Asher's last work was directing the television reunion movies I Dream of Jeannie... Fifteen Years Later (1985) and Return to Green Acres (1990). One does not often hear the word auteur with regards to those who work in television, but it could easily be applied to William Asher. While he only wrote one episode of Bewitched, he produced the entire run of the series and directed a lion's share of its episodes. There can be no doubt he had a large role in shaping the show. It is not enough to say that Bewitched could have been a very different show without William Asher, it seems possible that it might never have come to exist. Of course, William Asher's career went well beyond Bewitched. In fact, he had a far larger impact on American pop culture than many television directors and producers probably do. He directed around 100 I Love Lucy episodes--his very first was the classic "Job Switching," in which Lucy and Ethel go to work in a chocolate factory. With Sidney Sheldon he was co-creator of The Patty Duke Show and directed some of that show's episodes. Beyond television, he was largely responsible for American International Pictures' "Beach Party" movies. He directed the first film, while he directed and wrote stories for the rest. Mr. Asher also directed a wide array of television shows, from The Twilight Zone to Gidget. While many television producers have had an impact on pop culture, few have had the impact that William Asher did. 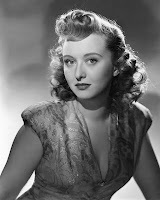 Award winning star of stage, screen, and television Celeste Holm died on 15 July 2012 at the age of 95. Two weeks ago she was in hospital suffering from dehydration after a fire in Robert De Niro's apartment, which was in the same apartment building as her apartment. Celeste Holm was born 29 April 1917 in New York City. It when her grandmother took her to see ballerina Anna Pavlova that Miss Holm began her love affair with the theatre. Miss Holm would study ballet for ten years when she was young. Her father worked for Lloyds of London and her mother was a painter and writer, so the family moved frequently during her childhood. Celeste Holm attended 14 different schools as a child. She studied drama at the University of Chicago. Celeste Holm made her debut on Broadway in Gloriana in 1938. Her first real success on Broadway would come in 1939 in the role of Mary L. in The Time of Your Life. Miss Holm would return to Broadway many times and had a highly successful career on stage. On Broadway she would appear in such productions as The Damask Creek, Oklahoma!, Bloomer Girl, Affairs of State, The King and I, Third Best Sport, Invitation to a March, Mame, Habeas Corpus, and I Hate Hamlet. Off Broadway she appeared in A Month in the Country, Paris Was Yesterday, and With Love and Laughter. Celeste Holm made her debut in Three Little Girls in Blue (1946). From the late Forties into the Fifties she appeared in such films as Gentleman's Agreement (1947--for which she won the Oscar for Best Actress in a Supporting Role), Road House (1948), The Snake Pit (1948), Everybody Does It (1949), Come to the Stable (1949--for which she was nominated for the Oscar for Best Actress in a Supporting Role), All About Eve (1950--for which she was nominated for the Oscar for Best Actress in a Supporting Role), The Tender Trap (1955), and High Society (1956). In the Sixties she appeared in such films as Bachelor Flat (1962) and Doctor, You've Got to Be Kidding! (1967). In the Seventies she appeared in the films Tom Sawyer (1973), Bittersweet Love (1976), and The Private Files of J. Edgar Hoover (1977). From the Eighties to the Teens Miss Holm appeared in the film 3 Men and a Baby (1987), Still Breathing (1997), Alchemy (2005), and Driving Me Crazy (2012). Her final appearance on screen is to be in the yet to be released College Debts (2013). Celeste Holm made her television debut in 1950 on All Star Revue. During the Fifties she briefly had her own show, Honestly, Celeste!, on which she played a reporter for the fictitious New York Express. In the Fifties she appeared on such shows as Lux Video Theatre, The United States Steel Hour, Climax, Producers Showcase, Goodyear Television Playhouse, and Zane Grey Theatre. In the Sixties she was a regular on the sitcom Nancy. The series focused on the daughter of the President of the United States (the "Nancy" of the title); Miss Holm played press secretary Abby Townsend, who was often called upon to chaperon Nancy. She also appeared on such shows as Play of the Week, Follow the Sun, Checkmate, Alcoa Premiere, Dr. Kildare, Burke's Law, Mr. Novak, Run for Your Life, The Fugitive, The F.B.I., Insight, and The Name of the Game. She also appeared in the 1965 television adaptation of Rodgers and Hammerstein's Cinderella. In the Seventies Celeste Holm appeared on such shows as The Delphi Bureau, Medical Centre, The Streets of San Francisco, The Manhunter, Wonder Woman, Lucan, and Fantasy Island. In the Eighties she was a regular on the shows Jessie, Falcon Crest, and Christine Cromwell. She appeared on such shows as Archie Bunker's Place, Matt Houston, and Spenser: For Hire. In the Nineties Miss Holm was a regular on the series The Promised Land. She appeared in such shows as Cheers and Touched by an Angel. In the Naughts she was a regular on The Beat and appeared on the shows Third Watch and Whoopi. Celeste Holm was a prolific actress with an extraordinarily long career. Her career lasted over seventy years, having made her debut on Broadway in 1938 and her last film coming out next year. This is all the more remarkable when one considers that she acted on stage, in films, and on television, and she did a good deal of charity work as well. Among the many charities in which she was active was UNICEF and the National Mental Health Association. It would seem that Celeste Holm had an endless amount of energy very nearly until her death. Of course, if Miss Holm was very much in demand as an actress, it was perhaps because she was so versatile. She was the original Ado Annie, "the Girl Who Just Can't Say No," in the stage production of Oklahoma! At the same time she played Karen Richards, Margo Channing's (Bette Davis) sophisticated best friend and the one person who first realises what sort of power Eve Harrington (Anne Baxter) actually wields. Over the years she played everything from a fashion editor (Gentlemen's Agreement) to a Fairy Godmother (Cinderella), and she did all of them well. My strongest memory of Celeste Holm is from the musical version of Tom Sawyer, a movie which I think has largely been forgotten everywhere except Missouri. In the film Celeste Holm played Tom's Aunt Polly. Even when I first watched the film as a child, it seemed to me that she was the living embodiment of Aunt Polly. Indeed, to this day I cannot read The Adventures of Tom Sawyer without picturing Celeste Holm as Aunt Polly. Such was the power of Miss Holm's talent that she could take any character and make them real, more so than most actresses of her time or since. Jon Lord, legendary rock keyboardist and founder of Deep Purple, died today at the age of 71. The cause was pulmonary embolism. He had been fighting pancreatic cancer since last yer. Jon Lord was born 9 June 1941 in Leicester, Leicestershire. Starting at age five he studied classical music. As he grew older he began to be influenced by such legendary blues organists as Jimmy Smith and Jimmy McGriff, as well as such rock 'n' roll acts as Jerry Lee Lewis. Around 1960 Mr. Lord moved to London to attend drama school, but it would not be long before he would find himself in the world of music again. He joined the rhythm and blues band Red Bludd's Bluesicians (also known as The Don Wilson's Quartet) in the early Sixties. The Red Bludd's Bluesicians would break up in 1963, at which point former Bluesicians Jon Lord and guitarist Derek Griffiths would join The Artwoods, led by former Blues Incorporated vocalist Art Wood. The Artwoods would be among the most respected English R&B bands to emerge in the Sixties, producing music to rival The Yardbirds, The Spencer Davis Group, and The Birds (Art Wood's younger brother Ron's band, not to be confused with American folk rock group The Byrds). Unfortunately, they would see little in the way of commercial success. Their first single, a cover of the Leadbelly song "Sweet Mary," did not chart. The Artwoods would release five more singles on Decca, none of which charted either. Sadly, their lone album, Art Gallery, and three EPs, saw little success as well. At the end of 1966 Decca dropped the band. The Artwoods signed a single record deal with Parlophone, which led to the single "What Shall I Do"/"In The Deep End," which did not go anywhere either. Finally, billing themselves as "St. Valentine's Day Massacre," they released the single "Brother Can You Spare A Dime"/"Al's Party" on the Fontana label. Despite producing some very fine records, The Artwoods saw little success and disbanded. In the Sixties Jon Lord would also do a good deal of session work and fill in for musicians when needed. He apparently played piano and organ on some of The Kinks' early work (not all of which may have been released). In 1968 he toured with The Flower Pot Men, replacing their keyboardist (who was sick). He also did session work with the band Boz. It was in 1967, in the wake of the break up of The Artwoods, that Jon Lord formed The Santa Barbara Machine Head. The band included Ron Wood, Art Wood's younger brother and former member of The Birds. The Santa Barbara Machine Head recorded only three songs ("Porcupine Juice", "Albert", "Rubber Monkey"), which were later released on Immediate Records on the compilation album Blues Anytime Vol. 3 in 1968. It was in 1967 that Chris Curtis of The Searchers contacted London businessman Tony Edwards in hopes that he would manage a supergroup that Mr. Curtis had envisioned in which musicians would get on and off like a roundabout (that is, a merry-go-round). Edwards agreed to manage the band, along with partners John Coletta and Ron Hire. Jon Lord was the first musician recruited and then guitarist Ritchie Blackmore. Chris Curtis would not remain with Roundabout, as the band was called, for long. It was Messrs. Lord and Blackmore who decided not to abandon the project, but to continue without Chris Curtis. It was Jon Lord and Ritchie Blackmore would recruit the remaining members of what would soon be called Deep Purple (named for Ritchie Blackmore's grandmother's favourite song). It was in July 1968 in the United States and in September 1968 in the United Kingdom that Deep Purple's debut album, Shades of Deep Purple, was released. While the album did not perform well in the United Kingdom, it sold very well in the United States, where it peaked at #24 on the Billboard albums chart. The band's first single, a cover of Billy Joe Royal's "Hush," went to #4 on the Billboard Hot 100 and #2 on the Canadian singles chart. Their second album, The Book of Taliesyn, also did well in the United States. Sadly, the band's cover of Neil Diamond's "Kentucky Woman" would only reach #38 on the Billboard Hot 100. The band's eponymous third album was released in the United States in June 1969 and in the United Kingdom in September 1969. Unfortunately, a delay in its release in the United States and a nearly total lack of promotion on the part of the label Tetragrammaton resulted in Deep Purple bombing on the charts--it did not even reach the top 100 of the Billboard albums chart. Internal tensions also began to build in Deep Purple at this time, to the point that Rod Evans (vocals) and Nick Simper (bass) were fired from the band. They were replaced by voaclist Ian Gillan and bassist Roger Glover. Deep Purple's fortunes improved considerably with their fourth album Deep Purple in Rock. The album marked a move from Deep Purple's progressive rock and psychedlia sound of earlier albums to more of a hard rock sound. It also proved to be their first hit album in the United Kingdom, making it all the way to #4 on the British albums chart. A single independent of the album in the United Kingdom, "Black Night" would go to #2 on the British singles chart. Deep Purple would see continued success with their next album, Fireball, which hit #1 on the British albums chart. It would be their next album, Machine Head, however, that would see Deep Purple not only have great success in the United Kingdom, but would see them return to having big success in the United States. Machine Head would be a pivotal album in that Deep Purple embraced the genre of heavy metal then becoming popular. With influences ranging from classical to blues, Machine Head was harder than anything the band had recorded. The album went to #1 on the British albums chart and #7 on the Billboard albums chart. The single, "Smoke on the Water," went to #4 on the Billboard Hot 100 and #21 on the British singles chart. Machine Head would be the last Deep Purple song to hit #1 on the British albums chart. Regardless, Deep Purple's remaining albums did very well both in the U.S. and the UK. Who Do We Think We Are, Burn, Stormbringer, and Come Taste the Band all went hit the top fifty of the Billboard albums chart and the top twenty of the British albums chart. Unfortunately, the band was probably living on borrowed time when original member and founder Ritchie Blackmore left in June of 1975. The band continued until 1976, when Jon Lord and fellow remaining original member drummer Ian Paice decided it was time for them to disband. While Jon Lord was with Deep Purple, he also continued to compose orchestral pieces. His compositions for orchestras included Gemini Suite in 1972 and Sarabande in 1976. His first project after the break up of Deep Purple would be Paice, Ashton & Lord, a rhythm and blues, funk-soul, rock band featuring former Deep Purple drummer Ian Paice and singer and keyboardist Tony Ashton. The band released one album, Malice in Wonderland. Unfortunately it would not be successful. The group broke up after Tony Ashton fell off a stage and broke his leg. It was in 1978 that Jon Lord joined former Deep Purple vocalist David Coverdale's newly formed band Whitesnake. Whitesnake would have some early success in the United Kingdom, but very little in the United States until the release of the album Slide It In in 1984. During this period Jon Lord released two solo projects, Before I Forget in 1982 and the soundtrack to the television series Country Diary of an Edwardian Lady in 1984. He also guested on albums by George Harrison, David Gilmour, and Cozy Powell. According to Jon Lord, his job in Whitesnake was to add little more than a "halo" to the band. It was in 1984 that Jon Lord, Ritchie Blackmore, Ian Gillan, Roger Glover, and Ian Paice reunited as Deep Purple. The band released a new album, Perfect Strangers which went to #17 in the U.S. and #5 in the UK. Between 1987 and 1998 the band would release five more albums, each of which would do fairly well. Unfortunately, the revival of Deep Purple would not be without its difficulties. Ritchie Blackmore and Ian Gillan would disagree on the direction of the band, resulting in Mr. Blackmore leaving in 1993. Guitarist Steve Morse was chosen as his replacement. In 2002 Jon Lord amicably left the band, announcing his retirement. Jon Lord's retirement would be more active than that of most people. In 2002 he released the solo album Pictured Within. In 2002 he also composed Boom of the Tingling Strings, a piano concerto in four movements. He also performed with Australian blues group The Hoochie Coochie Men, recording two albums with them. In 2004 he released another solo album Beyond the Notes. In 2008 he composed the classical work Durham Concerto. In 2010 he released his final, original solo album To Notice Such Things. It is difficult to access the importance of Jon Lord in the history of rock music. As the keyboardist of Deep Purple he was fundamental in the development of both progressive rock and heavy metal. He combined his classical training with influences from blues and early rock 'n' roll in a way that would prove important to both genres. Indeed, Jon Lord was among the greatest rock keyboardists of all time, quite possibly the greatest. While many of his contemporaries (Keith Emerson of Emerson, Lake, and Palmer) among them would turn to the Moog synthesiser, Jon Lord continued to rely primarily on the Hammond organ. Of course, it must be pointed out that Jon Lord could make a Hammond organ do things that other keyboardists could only dream about. Of course, Jon Lord was also a composer as well as a keyboardist. With various other members of Deep Purple he composed some of the group's best songs: "April," "Fireball," "Smoke on the Water," "Space Truckin'," and others. He also composed several classical works that met with a good deal of popular success and critical acclaim. As both a keyboardist and a composer he made contributions to music that few others have. It must be pointed out that along with drummer Ian Paice, Jon Lord was a constant in Deep Purple. Other members might come and go, but until his retirement in 2002, Jon Lord was always a part of his band. Indeed, it seems quite possible that had it not been for Jon Lord's talent as a keyboardist, his skill as a composer, and his willingness to experiment, Deep Purple might not be the legendary band they are today. I must confess that I always was a huge fan of Jon Lord. I do not even remember the first time I ever heard Deep Purple; they have simply always been a part of my life. A large part of the lure of Deep Purple for me was Jon Lord's keyboard work. The band had rose in an era known for an emphasis on the Hammond organ (just look at Vanilla Fudge and Iron Butterfly), but Jon Lord's playing not only stood out from the pack, it also held up over time. As a youth in the Eighties I could listen to old Deep Purple songs and they would not sound dated at all. It is an incredible achievement for any artist to create works that are essentially timeless, and that is precisely what Jon Lord did. I very seriously doubt there will be a keyboardist like him ever again.